Do you have the guts to look out of the windows in the statue's crown? If you climbed the stairs up to the crown of the Statue of Liberty some 25+ years ago, you might vividly remember the slow ascent squished in line, slowly shuffling up one step at a time closely followed by the person immediately behind you. If you were to visit the crown today, now that they've re-opened access, you'll find a dramatically different experience (thank goodness!) Here's what you'll want to know if you're thinking about climbing to the crown on your visit to the Statue of Liberty. Visiting the crown requires walking up 363 steps in each direction. It's a fairly steep, but safe, climb (particularly the last 146 steps which are up a narrow double-helix staircase). It's the equivalent of climbing 27 stories. Visitors who are used to lots of walking should have no trouble making the ascent, but it isn't recommended for young kids (under 8) or people who aren't at least moderately fit. The new system has dramatically reduced the number of people who can access the crown each day. The upside of this is that the staircase is never crowded and you can take the steps at your own pace. There are many places where you can take a break, but there is no elevator service and there is no assistance. According to the Rangers at the top of the crown, it tends to be busiest at the crown in the morning and very quiet in the afternoon. They limit the number of people who are ascending the staircase at any one time, so it's possible that you could find yourself waiting for your turn, but unlikely. The downside of this is that there are far fewer crown access tickets and they must often be booked far in advance. One of the best parts of climbing to the crown is getting to see the interior of the statue. Once you arrive at the top, there are a few small windows to look out of, but it's not a great spot for taking photos and your time there will likely be limited to just a few minutes. You'll have to pick-up your crown access ticket at the will-call booth inside of Castle Clinton before joining the line for pre-boarding security. Bring your confirmation number, photo ID and the credit card you used to purchase the tickets. Before boarding the ferry to Liberty Island, you'll need to clear security. The security is similar to what you might expect at an airport -- you'll need to remove outerwear, have your bags and other items x-rayed and then walk through a metal detector. Fortunately, this takes place in a climate controlled area, so it's a comfortable respite from the rest of the experience which is almost fully exposed to the elements, whether it's a cold winter morning or a hot summer afternoon. The actual ferry ride to Liberty Island takes about 15-20 minutes, including boarding time. The "time" on your ticket refers to the time when you should arrive at the crown access security check-point on Liberty Island. At that point, you will show your ticket and ID and receive a wrist-band granting you access to the crown. Lockers are available to store your belongings while you visit the interior of the Statue of Liberty. Visitors are allowed to bring a camera and water bottle into the Statue. The interior of the Statue is not air-conditioned (or heated) so dress for the weather. 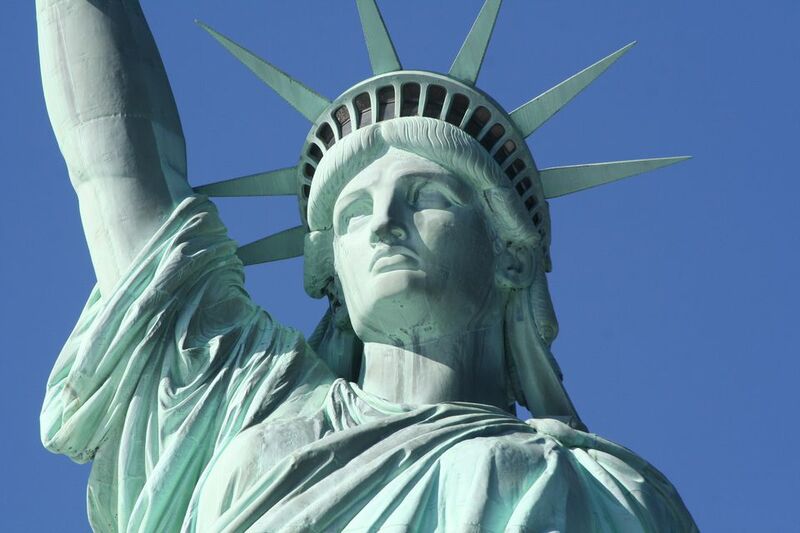 Access begins with a visit the Statue of Liberty Museum in the pedestal of Statue. Here you can see the Statue's original torch up close before heading up to the pedestal. You can take an elevator to the pedestal level of the Statue, but beyond that, there are just steps. Depending on your pace, it will take about 15-20 minutes to climb to the top of the crown and back, but you might want to spend some time on the pedestal level before or after your ascent. Wear good footwear -- between waiting for security, boat rides, and climbing the stairs, you're going to spend a lot of time on your feet. Use the bathroom once you clear security to enter the monument. These are the only facilities available inside of the Statue and you don't want to have to quit before you reach the top because you have to hit the washroom! In the summer, be prepared for the heat. Stay hydrated and be aware that inside of the Statue can be much warmer than outside. Visit early in the morning if you want to make it to the crown before the heat does. Take advantage of the (included) audio-tour. There are options for both adults and children and it really enhances the experience of visiting the Statue of Liberty. The audio tour has spots both inside the museum as well as outside around Liberty Island. Ask the rangers if you have any questions! There are Park Rangers stationed throughout the Statue of Liberty who are tremendously helpful and knowledgeable. Don't forget to allow time to visit Ellis Island.